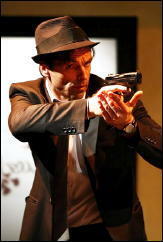 » A Review by Geoff Bradley: Carter Brown’s THE STRIPPER (The Musical). A Review by Geoff Bradley: Carter Brown’s THE STRIPPER (The Musical). So there I was, browsing through the local weekly free paper when there was an article about Richard O’Brien, songwriter for The Rocky Horror Show, and how he had a musical being performed at the Queen’s Theatre, Hornchurch. Now I have spoken before of my attachment, from a relative early age, to the books of Carter Brown, and I quickly made my way up to the Carter Brown section of the loft where I found the 1961 Signet edition of the book (reviewed here ). I quickly found the Queen’s Theatre website and booked tickets for the Saturday matinee and then set to re-reading the book. Travel to Hornchurch, about 25 miles away, was very convenient by train so Helen and I had a leisurely journey followed by lunch in Hornchurch and a walk to the theatre. I bought a programme and read that Richard O’Brien had read lots of Carter Brown’s books. On entering the theatre, the first thing to see was a large rectangular book-shaped screen with, projected on to it, the Signet cover. As the show started the projection changed to the outside of the 15th floor of the hotel with Patty Keller perched on the ledge. From then on the action followed the book faithfully (although Sergeant Polnik is, unfortunately relegated to a walk-on part and, for some reason, Sherry Rand of the book is renamed as Sherry Mendez), with huge chunks of dialogue lifted verbatim until an understandable alteration to the ending that changed setting and timing but not culprits. This was interspersed with song whose lyrics would not, perhaps, compete on a Cole Porter level, but worked in the more lowly context of Carter Brown. A six piece band (with trumpet, sax and piano prominent), sited on a raised platform at the back of the stage, were excellent, playing the jazz-tinged score. Music was written by Richard Hartley, lyrics by Richard O’Brien and Carter Brown was credited, quite rightly, with the book. Richard O’Brien says in the programme that he was asked to write a musical for the Sydney Theatre Company back in 1980 and being familiar with the works of Carter Brown, a chance meeting with his daughter, turned his thoughts to using a Brown book as the source material. He originally intended, he says, to write another rock’n’roll musical but came to realise that Brown’s characters were more likely to listen to Ella Fitzgerald and Sinatra. After the performance, Helen (on my behalf, I’m a bit shy in that regard) asked if there were any spare posters for the production lying around and eventually a very kind lady produced one for me. At that point she said why don’t you get Richard O’Brien to sign it, he’s just coming down the corridor. So as I asked O’Brien to sign my poster, I confessed that I had been a Carter Brown reader since my adolescence. He told me that he had met Brown (Alan Yates) and had got to know his family quite well. 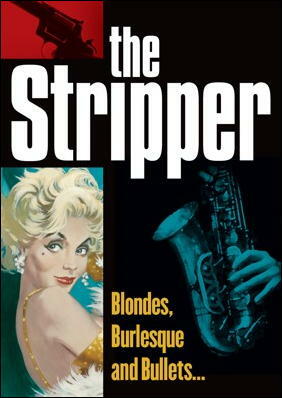 Also that it was his copy of The Stripper (Signet, 1961) that had been used on for the pre-show image that was projected on to the book shaped screen. It wasn’t until I got home that further reading in the programme told me that he owned a lot of “pulp fiction” and he had collected it for years. A spot of Googling enabled me to find details of the original production in Sydney with one site listing all the original lyrics (though there had obviously been some revision since Polnik has a song in the original) and another on which the soundtrack LP could be listened to. I have to say that the whole production was excellent. 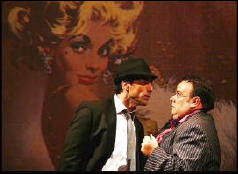 The scene changes were smoothly and cleverly done, the cast were excellent, the songs were witty and the music enjoyable. The production, for which the best single word to describe it is perhaps ‘fun,’ was enthusiastically received by the audience and both I, as a Carter Brown veteran wanting a faithful interpretation of the book, and Helen, with no interest in the Brown or the comedy-pulp sub-genre, both thoroughly enjoyed the whole performance. Editorial Comment: The webpage for the Queen’s Theatre production appears to have been archived, so perhaps the link will stay active for a while. I envy you getting to see this. Thanks for letting us know about it. Just from the pictures alone I wish I had seen it. What next, a musical verison of NO ORCHIDS FOR MISS BLANDISH? Great that somebody remembers Carter Brown. Read a lot of his books as a teenager. Favorites were of course the Al Wheeler books, but had a soft spot for Danny Boyd too. You’ve come to the right place. I think there are a lot of Carter Brown fans among those that read this blog!